One of the sites we visited was the Theresienstadt concentration camp, which was a concentration camp located in German-occupied Czechoslovakia established by the Schutzstaffel, Nazi regime’s secret police during World War II. 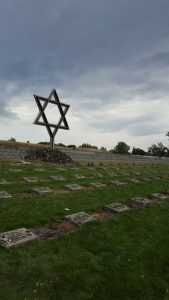 When we visited the site, it was evident that it was one of the deadliest places on Earth as we witnessed the massive grave-field of those who suffered in the hands of the Nazi military. As we walked into rooms that the prisoners lived and the solitary confinement rooms, the insurmountable terror and utter despair are what I could possibly imagine for those who have suffered from the atrocities during World War 2. When we visited a museum about the Holocaust history, historical documents and news reports at the time clearly indicated that the Jewish population were deceived into entering these camps as they were told to be going to ‘recreational facilities’. Even the German population themselves were deceived as they were told that people who entered these camps were either political prisoners or communists or ‘enemies of the state’, and some are motivated to join the Nazi regime as they believed in the message. However, some may argue that the German population were actually not deceived and were aware of the atrocities committed against the Jewish population. In fact, these views are substantiated as more interviews with wartime survivors were carried in recent years, and researchers found that people who had knowledge of these mistreatments have decided to become complicit or turn a blind eye against the victims of the Nazi party. The reason why I studied the Holocaust history is not only because the Holocaust represents the extremity of evil, but also the ‘banality of evil’, a phrase coined by Arendt in her book on the post-war trial of wartime criminals. With that being said, this trip reminds me that when a group of ordinary citizens feel frustrated about the status quo, they might be driven to pursue extreme means, and these dangerous tendencies are something that we must be cautious about. Therefore we have to learn about these tragedies of history so that we could prevent them from happening. If we don’t learn from the painful lessons of the Holocaust, we wouldn’t be able to recognise that sometimes the state might act against the interest of the people, and how the general public might be manipulated so as to protect the interest of the state. If we do not understand how these tragedies might occur to us, the risk is much higher. In other words, mistakes made in the past are to be redressed, not repeated.